Leaks in concrete structures are a problem that homeowners have struggled with for decades. Frustrated homeowners and professionals have tried to stop the water and leaking with sealers and patches of various kinds however they have had no luck. MidAmerica Basement Systems now proudly offer Chemical Injection. Chemical injection is a process in which a special polyurethane resin is injected into a crack hole, joint or another opening in concrete. First holes are drilled in the wall at a 45-degree angle to cross the crack halfway through the wall. Then, special high-pressure injection ports are securely installed into the wall. Next. the poly resin is pumped into the cracks or joints. The appearance of the sealant on the inside is a positive indication of its migration all the way through the crack. After the resin is pumped into the wall the ports are removed and the holes are filled. For a nice appearance, a cement coating is then applied. Full basement waterproofing in Marseilles, IL. I have a concrete walkway to the front porch that has sagged. Garage floor is sunken in one corner and needs to be raised. Seepage in basement after heavy rains as well as back water from floor drains when city sewers are over run from heavy downpour. Hi! I am a realtor and my client is going to be purchasing this home. There is a foot of water in the crawl space that gets pumped to another sump pump. My client would like an estimate and opinion on what he should do to take care of it. I would need to let you in to the property for the estimate. There is another area in the crawl as well that has water, but an inspector can't figure out where it's coming from. We have a walk out basement with a cement retaining wall on one side that in the last 13 years has leaned out about an inch.It has cracked not at the house foundation but further out.there are railroad tie steps on the other side of it going down the hill. We are trying to sell our house and this is detouring buyers.We would just like the wall moved back in place the wall it's self is in good condition .The wall is 25 ft long and tapered. We are right off of I -80. Crawl space under less than 1200 sf home. Basement leaks when it storms it flooded last year and since the drain gets backed up. Could hardly tell the crew was even there. The main reasons why we hired your company over any other company is because of your good representation, fast repair time (3 weeks), and your willing to travel. We will properly install a hidden drainage system in your Marseilles basement and completely encapsulate your crawl space with CleanSpace vapor barrier. We are here to solve the problem for you. Unlike the average Marseilles contractor we use completely inorganic, waterproof materials. Even if the basement floods your walls and floors will not be damaged by the water. These waterproof products are patented and are built to create an attractive finished basement that lasts a lifetime. Foundation problems such as bowing foundation walls destroy your Marseilles home’s value and can be dangerous. Our in-house team of structural and geo-technical engineers are here to help. We design and install the right solution and usually have the project finished in less than a week. You will have peace of mind as we provide a 25-year written warranty against defects on our foundation products. The sunken, cracked concrete around your Marseilles home is both an eyesore and a safety hazard. It is also likely to get worse, but we can fix it for you. If you think you might have radon gas seeping into your home, it's time to take action. 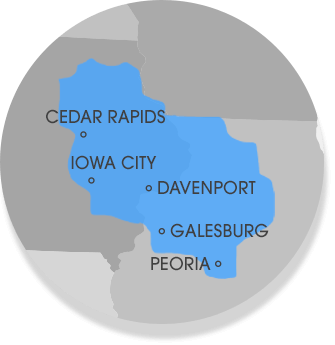 We help homeowners in Marseilles, IL with radon testing, and can even provide a FREE quote for the cost of a radon mitigation system for your home. The team drills into the foundation walls to make the connection between the earth anchor and the wall anchor. A metal rod connects the earth anchor to the wall anchor. The wall anchor installed. The team cut the remaining rod and mechanically fastened the wall anchor to stabilize the walls. New Waterproofing System in Marseilles, IL. Homeowner Joyce was interested in having her home waterproofed. She called MidAmerica Basement Systems to learn more about all of her waterproofing options. She decided that having a full perimeter waterproofing system was the best idea for her and her home. WaterGuard is installed along all of the exterior walls of the home. The WaterGuard is a channeling system that moves the water to the sump pump. The sump pump then pumps the water out. First holes are drilled in the wall at a 45-degree angle to cross the crack halfway through the wall. Then, special high-pressure injection ports are securely installed into the wall. Next. the poly resin is pumped into the cracks or joints. The appearance of the sealant on the inside is a positive indication of its migration all the way through the crack. After the resin is pumped into the wall the ports are removed and the holes are filled. For a nice appearance, a cement coating is applied. It is important that the repair not is affected by the wall movement as a solid. Our cinder block basement walls have large cracks and are bowed. We are available weekends and evenings, and email is the best way to contact me. I have a 7 year old home I developed a leak on a crack below a basement window. Looking to get repaired . We have one wall/floor area where we are getting water seepage. Our house is 100+ years old. We currently have a wood foundation. It doesnt seem to be leaking anywhere that I can tell, but we finished a room in the basement and one of the walls is really bowing. Looking to see how this can be fixed.